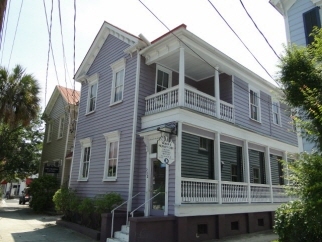 Near the heart of downtown Charleston, a stand alone "Charleston Single" building that is within blocks of Marion Square, College of Charleston, MUSC, etc. First floor is currently being used as medical office. Second floor is apartment with separate entrance. Separate meters for utilities. Building was renovated after 1989. Renovations included: new foundation, elevating building, upgraded electrical and plumbing, new fixtures, glass enclosed porch. Wired for internet and phone. Paved parking for three (more if vehicles are stacked).